This Mango Coconut Chia Pudding makes a great high-protein breakfast or a lovely sweet and healthy dessert. I love these little chia coconut puddings, They are so easy to make and they are nourishing and delicious. The dried mango adds a rich flavour to the pudding. The coconut yoghurt adds a clean, fresh flavour and gives the pudding a lovely smooth and creamy texture. Chia seeds are a source of complete protein with all the 8 essential amino acids. They are also a great source of healthy omega-3 fatty acids, fiber, protein, antioxidants, calcium and potassium. The high fiber content aids digestion. The high content of omega-3 fatty acids promotes heart health. Coconut yoghurt and coconut rice milk are both great non-dairy alternatives to traditional milk and yoghurt. Coconut yoghurt is a also good source of bone-building calcium and magnesium, a mineral essential for healthy muscle function. It also contains high levels of potassium and iron which are important to maintain your energy levels. 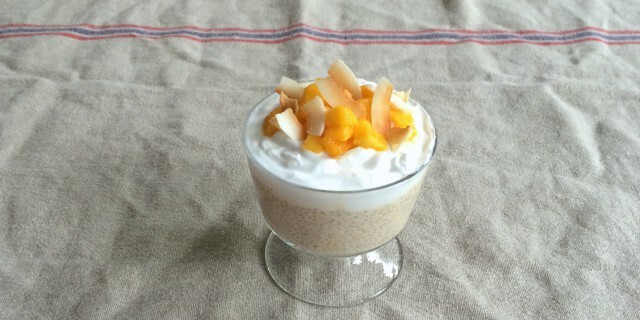 Mix the chia seeds with coconut rice milk, ground mango, vanilla powder and 1/2 cup of coconut yoghurt. Add coconut nectar if you like it on the sweet side. Just before serving, add a layer of coconut yoghurt. Top with fresh mango and toasted coconut flakes.